Wheat bran, a by-product of the dry milling of common wheat (Triticum aestivum L.) into flour, is one of the major agro-industrial by-products used in animal feeding. It consists of the outer layers (cuticle, pericarp and seedcoat) combined with small amounts of starchy endosperm of the wheat kernel. Other wheat processing industries that include a bran removal step may also produce wheat bran as a separate by-product: pasta and semolina production from durum wheat (Triticum durum Desf. 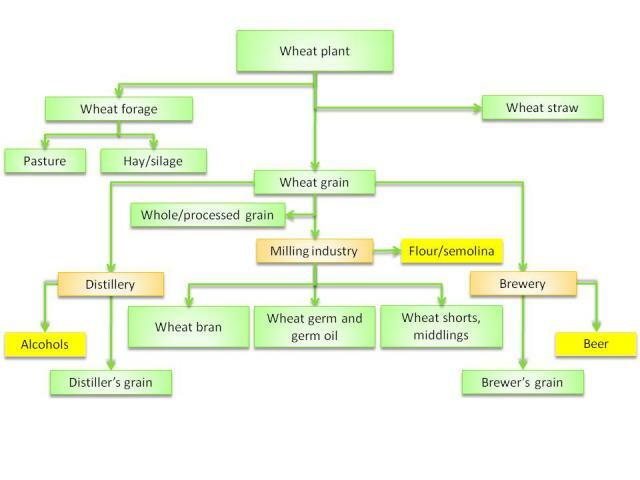 ), starch production and ethanol production. It is important to note that wheat bran is not a product with a universally accepted definition and clear boundaries. Though national regulations may contain mandatory requirements on bran composition, ingredients sold under that name encompass a wide range of wheat by-products. Milling yields variable proportions of flour, depending on the quality of the final product. The extraction rate (flour:grain ratio) goes from 100% for a wholemeal flour to less than 70% for pastry flour. Typical extraction rates range from 75% to 80%, resulting in 20 to 25% wheat offals (Kent et al., 1994). Wheat bran represents roughly 50% of wheat offals and about 10 to 19% of the kernel, depending on the variety and milling process (Ash, 1992; WMC, 2008; Prikhodko et al., 2009; Hassan et al., 2008). In the industrial milling process, after a cleaning step that removes grain impurities, the grains are tempered (soaked to toughen the outer layers and mellow the starchy endosperm in order to facilitate their separation) and then subjected to a series of grinding operations that produce finer and finer flour particles. The first grinding steps yield coarse particles of broken wheat and bran, and the later steps produce other by-products (WMC, 2008). Milling by-products are traditionally named after their quality (fineness, colour, etc.) and/or the stage of the process at which they arose, with considerable variations between languages, countries, regions, milling processes and even mills. In industrial countries, these products used to be sold separately (coarse bran, fine bran, middlings, second clear, thirds, etc.) but are now mixed together in variable proportions (MacDonald et al., 2002). Consequently, wheat milling offals form a continuum of products with a decreasing fibre:starch ratio, from the fibrous coarse brans produced by the first grinding steps to starchy feed-grade flours. Wheat brans sold for animal feeding are typically mixtures of true coarse brans and finer products from the later grinding stages. In rural and traditional milling, flour is directly separated from bran in a one-step milling and screening. 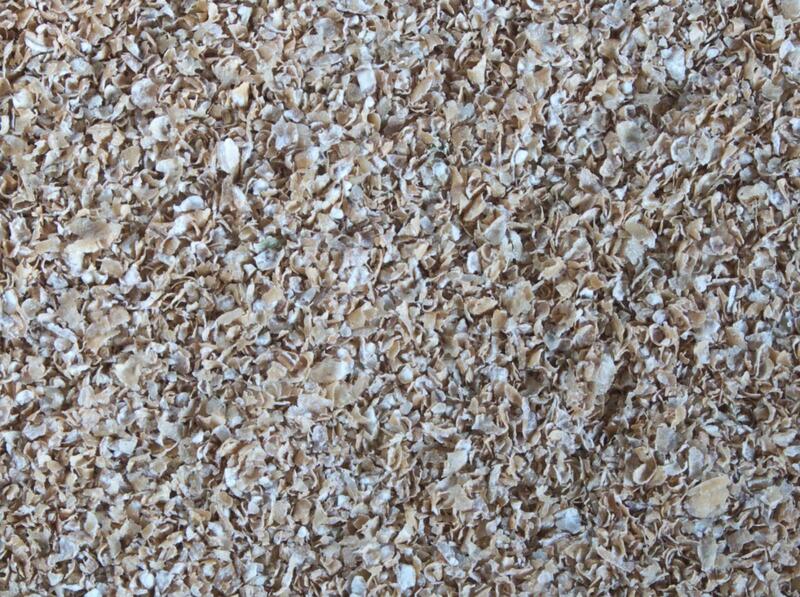 This type of bran has a higher starch content and a higher nutritive value (Piccioni, 1965). In Ethiopia, farmers prefer high-density bran since weight indicates that the bran contains more flour and thus higher energy (Gebremedhin et al., 2009). The situation is made even more complex by the existence of wheat brans from other wheat species (durum) and wheat processing industries. Wheat bran is suitable for livestock feeding and very palatable to most classes of animals (Fuller, 2004; Piccioni, 1965). Wheat bran is a bulky feed that can be used to lighten dense, heavy feed mixtures. It can be readily incorporated into mashes. Good bran should have a fair coating of flour and be in the form of large, dry and non-adherent flakes. It is sold raw or pelleted (Göhl, 1982). Wheat bran is exported worldwide and is a major feed commodity. However, worldwide production figures are difficult to assess. Wheat production for human consumption (total supply minus wheat produced for animal feeding, seed or wasted) was estimated to be 456 million tons in 2007. When calculated using a bran production rate of 10-19% (see Description above), worldwide wheat bran production is comprised between 45 and 90 million tons. The main producers should be the main users of milled wheat: China, India, the USA, the Russian Federation, Pakistan, Turkey and France (about 75% of the production) (FAO, 2011). Protein, minerals, oil and fibre are mainly found in the outer layers of the grain, and wheat bran is richer in these nutrients than the whole grain. Wheat bran is relatively rich in protein (14-19% DM, sometimes higher) and minerals (4-7% DM), notably calcium (0.07-0.2% DM) and phosphorus (0.9-1.3% DM). Its oil content (3-5% DM) is higher than that of the whole grain. The fibre and starch contents are inversely correlated and extremely variable, as they depend on the relative amounts of envelopes, endosperm and other fractions mixed together. However, a product marketed as bran should contain relatively high amounts of fibre: crude fibre 7-14 DM, NDF 35-54% DM, ADF 9-16% DM and low amounts of ADL 2-4% DM. Wheat bran should also contain about 15-30% DM of starch (Feedipedia, 2011). Fibre is the main constraint for the utilization of wheat bran in animal nutrition, particularly in monogastrics. For that reason, the energy values of wheat bran (DE, ME, NE) are always lower than those of the whole grain, in all animal species. Wheat bran contains pentosans, which are thought to have antinutritional activities in poultry and result in depressed nutrient utilization and poor growth (Choct et al., 1992). Wheat bran has a high phytase activity, which is beneficial to phosphorus availability in pig and poultry diets. However, this phytase activity may be considerably reduced when wheat bran is processed into pellets because heat treatments destroy phytase (Cavalcanti et al., 2004). Wheat bran contains a very heat-stable lipase that causes hydrolytic rancidity and is more active if the bran is finely ground (Allen et al., 1994). However, wheat bran contains low amounts of fat and no health problems due to rancidity have been reported in livestock. Large amounts of bran can induce calcium deficiency in horses, known as Nutritional Secondary Hyperparathyroidism, and also as "big head disease", "bran disease" or "Millers Disease", because milling companies often fed their horses rations containing large amounts of bran (Kohnke et al., 1999). Growing bone is frequently rachitic, and brittle and fractures may be common and heal poorly. Swelling and softening of the facial bones and alternating limb lameness are frequently reported (Kahn, 2005). When available, wheat bran is often a component of the concentrate in ruminant diets, due to its content of important nutrients: protein, minerals, fibre and starch. Maximum recommended inclusion rates are 10% in calves, 20% in dairy cows, 25% in beef cattle, 5% in lambs and 20% in ewes (Ewing, 1997). It has a slightly laxative effect, partly because the bran fibre is only moderately digested (Göhl, 1982). Like maize grain and soybean meal, wheat bran is such an important staple of ruminant diets that most trials involving wheat bran are about replacing it with local ingredients, as described in the following paragraphs. In Bangladesh, in a comparison of fishmeal and wheat bran diets for local lactating cows, it was concluded that the use of wheat bran resulted in slightly higher net returns over feed costs from selling milk due to the lower cost of the wheat bran diet (Khan et al., 1992). In Pakistan, a comparison of maize bran, wheat bran and rice bran for milk production of Holstein Friesian cattle showed that the wheat bran diet reduced milk yield compared to maize bran, but was better than rice bran (Tahir et al., 2002). In India, crossbreed dry cows on a straw diet supplemented with wheat bran gave superior results (feed intake and nutrient utilization) than those supplemented with deoiled rice bran (Singh et al., 2000). In the USA, supplementation of beef cows and steers consuming low-quality, tallgrass prairie forage with wheat offals, bran or second clear (a high-starch product), and soybean meal showed that the nature of the milling by-product did not affect performance, intake and digestion of low-quality forage. The degradable protein intake was sufficient to mask any negative effects exerted by increasing levels of starch (Farmer et al., 2001). Supplementation of steers grazing endophyte-free fescue pasture with wheat bran at 0.48% of live weight increased live weight gain, but less than supplementation with cracked maize (Hess et al., 1996). In India, the supplementation of crossbreed bulls fed chopped green sugarcane tops with a concentrate mixture of wheat bran (50%) and lentil chuni, a by-product of lentil processing (50%), resulted in better intake, nutrient digestibility and growth than when the supplement contained only wheat bran or only lentil chuni. This was explained by better rumen fermentation with the wheat bran + lentil chuni supplement (Gendley et al., 2002; Gendley et al., 2009). In India, in growing lambs fed wheat straw as the sole forage, replacement of maize grain with the cheaper wheat bran reduced the cost of the concentrate mixture, as well as feed cost per unit of live weight gain. Feed conversion efficiency was not affected and it was concluded that half of the maize grain could be safely and economically replaced with wheat bran in the concentrate mixture of growing lambs without reducing lamb growth rate (85-90 g/d) (Dhakad et al., 2002). In adult sheep, barley grain supplementation could be replaced with wheat bran at up to 50% of the diet (Singh et al., 1999). In Ethiopia, body weight was unchanged in Farta sheep fed hay alone or supplemented with either wheat bran or niger seed meal (Guizotia abyssinica), or with mixtures of the two feeds (Fentie et al., 2008). In India, wheat bran supplementation improved the utilization of various nutrients in goats fed mixed straw as the roughage source (Maity et al., 1999). In Brazil, weight gain and food conversion were not affected by the inclusion of rough wheat bran instead of maize in the diets of growing goats. It was concluded that up to 14% wheat bran could be included, as the diet contained less than 50% NDF (Dias et al., 2010). Wheat bran is a common ingredient in pig diets. It is usually palatable and can be fed to all classes of pigs with few problems. The main constraint is its high fiber content, which reduces its energy density: the net energy content of wheat bran represents 60 and 65% of the NE value of wheat for growing pigs and adult sows, respectively (Noblet et al., 2002). These energy values can be accurately estimated from measured chemical parameters (EvaPig, 2010). Pigs fed diets containing wheat bran tend to increase their feed consumption at a rate such that energy intake remains constant (Levasseur et al., 1998). This compensatory effect depends on the inclusion rate of wheat bran and on the duration of the period of adaptation to the bulky diet (Kyriazakis et al., 1995). The bulkiness of wheat bran limits its use in diets formulated for physiological stages where dietary energy content must be maximized (starter and grower pigs, lactating sows) and/or for housing conditions where appetite is limited by environmental factors (poor sanitary status, warm climate). In contrast, wheat bran can be used as an energy diluent during gestation in order to reduce hunger and improve welfare (Ramonet et al., 1999), health status (Meunier-Salaün et al., 2001) and reproductive performance (Matte et al., 1994). Gestation diets can contain up to 30% wheat bran. The use of wheat bran-rich diets around parturition is sometimes recommended to prevent sow constipation and metritis-mastitis-agalactia syndrome (Etienne, 1987). Data about the inclusion of high rates of wheat bran in lactation and grower/finisher diets are scarce. Wheat bran used at 48.5% in lactation diets did not impact the performance of low productivity sows (Schoenherr et al., 1989). This may not be the case in highly productive lactating sows and lower inclusion levels are then recommended for most lactation diets. In tropical conditions, sow performance during lactation was maintained with diets containing 36% wheat bran (Renaudeau et al., 2003). Increasing wheat bran inclusion from 0 to 20% did not significantly influence growth rate of growing pigs between 20 and 90 kg but increased the feed conversion ratio (Newton et al., 1983). When a diet with wheat bran is formulated in order to maintain the same NE content (with fat addition), both growth rate and feed conversion ratio are similar to a diet without wheat bran (Levasseur et al., 1998). The finisher diet can contain up to 30% wheat bran without any negative effect on performance (Hines, 1980). The nutritive values of wheat bran for poultry found in tables and publications are highly variable, due to the wide range of products found under this name. However, whatever the origin, protein, starch and lipid contents are relatively low while the fibre content is high. As a consequence the ME value is low and can be estimated by a fibre measurement such as crude fiber (Boudouma, 2010a). When diets are calculated by least-cost formulation, inclusion rates of wheat bran are generally low. However, in countries where this cereal by-product is abundant and inexpensive, low energy pelleted diets containing large amounts of wheat bran might be used. Large amounts of wheat bran can be used in molt diets for layers (Soe et al., 2009). When diets are presented as mash, high inclusion rates of wheat bran (more than 13%) tend to reduce feed intake in broilers (Boudouma, 2010b). Pelleting diets may overcome the detrimental effects of low density diets containing wheat bran. Laying hens fed diluted diets in which nutrient density was reduced by an inclusion of 45% wheat bran adjusted their feed intake only when the diets were pelleted while hens fed the mash diet ate less and produced lighter eggs (Vilarino et al., 1996). Wheat bran is a natural source of betaine, which is known to have positive effects on osmoregulation, carcass fat reduction and choline and methionine sparing in poultry (Kidd et al., 1997). For rabbits, wheat bran is a valuable source of energy, digestible fibre and protein. It is very frequently introduced into commercial diets (Lebas et al., 1984b; de Blas et al., 2010), and in reference diets in animal trials (Lebas et al., 2009). The inclusion level in experimental diets is frequently 45-50% or more. However, it can be up to 64-65%, in studies on wheat bran itself, or on ingredients replacing part of the wheat bran in control diets (Aduku et al., 1986; Berchiche et al., 2000; Blas et al., 2000a; Blas et al., 2000b; Fotso et al., 2000; Gidenne, 1987; Lakabi-Ioualitene et al., 2008; Lounaouci-Ouyed et al., 2011; Lounaouci-Ouyed et al., 2012; Gu et al., 2004; Parigi-Bini et al., 1984; Singh et al., 1997; Villamide et al., 1989). If necessary, wheat bran may represent more than 98% of the diet, without any problem (Robinson et al., 1986). In commercial feeds the introduction level is more moderate and is generally in the 15-35% range (de Blas et al., 2010). In the experimental reports presented during the 2008 World Rabbit Congress, the average dietary inclusion level was 19.1% (Lebas et al., 2009). Wheat bran can be used in feeds for growing rabbits and breeding does, provided that nutritional requirements are met (Hoffmann et al., 1993; Muir et al., 1995; Salma et al., 2002). Very high inclusion rates may be problematic due to the large variability in the starch content of wheat bran, as starch must be limited for rabbit kits around weaning (Gidenne et al., 2010). The crude fibre and ADF levels in wheat bran are lower than the minimum recommended for rabbits (de Blas et al., 2010), but the hemicellulose content, which is of greater importantance, is about 33% of the product and is highly digestible (72 % according to Gidenne, 1987). The hemicellulose plays an important role in preventing digestive diseases (Gidenne et al., 2010). Wheat bran is also an excellent source of phosphorus. Although most of the bran phoshorus is phytate-bound it does not interfer with the digestive utilisation of the phosporus in rabbits, because their digestive tract has an important bacterial phytate-degrading activity (Nelson et al., 1985; Furlan et al., 1994). However, in breeding does, the high phosphorus content of wheat bran may limit its use to moderate inclusion rates because phosphorus becomes relatively toxic when more than 0.75% is present in the diet (Lebas et al., 1984a; Lebas et al., 1990). A very fine grinding of wheat bran (1% particle remaining on the 1 mm sieve vs. 36% for the whole wheat bran) does not modify protein or crude fibre digestibility and only slightly improves (+ 3%) dry matter and energy utilization (Robinson et al., 1986). Durum wheat bran is more rarely used that bran from the bread flour industry, but large amounts are produced in countries with semolina or pasta industries. Experiments conducted in Algeria show that durum wheat bran may be used in rabbit feeding with the same limitations, if any, as common wheat bran (Berchiche et al., 2000; Kadi et al., 2004; Lakabi-Ioualitene et al., 2008). Wheat bran can be given to horses at up to 2 kg per day (Göhl, 1982). Horses find it palatable and enjoy eating feeds containing up to 10% bran (DM basis). Though it has long been popular as a laxative feed for stabled horses, this laxative effect is not significant as horses consume other sources of fibre. High inclusion rates of bran can induce calcium deficiency (see Potential Constraints above). Calcium, zinc and iron supplements should not be mixed into large amounts of bran, as they may become bound to the phytate in the small intestine, which will lower their absorption rate (Kohnke et al., 1999). The high fibre content of wheat bran limits its use to herbivorous and omnivorous fish. Recommended rates are generally between 2 and 5% and the bran should preferably be extruded (Hertrampf et al., 2000). Wheat bran has been tested and used in numerous fish species and higher inclusion rates seem possible in some situations. The nutrient digestibility of wheat bran in Nile tilapia was found to be relatively high for protein (75-84%) and amino acids (78-87%) but very low for energy (37-39%), and generally much lower than nutrient digestibilities of fish meal and other protein sources (Maina et al., 2002; Ribeiro et al., 2011; Sklan et al., 2004). Wheat bran is one of the main ingredients used by Tilapia farmers in subsaharan Africa (El-Sayed, 2013). In Kenya, with Nile tilapia fingerlings fed cereal brans (maize, wheat and rice) at 1.5% body weight, growth obtained with wheat bran was intermediate between that from maize bran (highest) and rice bran (lowest). However, wheat bran was more profitable (Liti et al., 2006). Common carp fed wheat bran at 3% body weight 3 times per day had better growth, feed conversion, DM in carcass, protein and energy retention than carp fed rice bran (extruded or not), but performance was lower than for carp fed biscuit wastes and wheat middlings (Shalaby et al., 1989). In carp fed a diet containing 48.5% of the test ingredient, protein digestibility was higher for wheat bran (81%) than for sorghum grain, but lower than for rye. Lipid digestibility was the highest for wheat bran (82%) (Degani, 2006). A carp diet containing 10% wheat bran gave better peformance than when 20% was used (Rahman et al., 1989 cited by Hertrampf et al., 2000). Wheat bran included at 30% in the diets of fingerlings of 3 Indian carp species (Catla catla, Labeo rohita, Cirrhinus mrigala) was found to be a suitable ingredient, with a relatively high digestibility for both protein (93%) and energy (80%). Carbohydrate digestibility was lower (68%) and inferior to that of cooked maize, but still higher than that of rice bran and rice polishings (Erfanullah et al., 1998). Labeo rohita carp fed diets containing between 5 and 15% wheat bran had a better weight gain during the first 3 weeks at the 15% rate but weight gains were identical after the first 3 weeks. Phosphorus retention was decreased in the groups given 10 and 15% bran (Mitra, 1988). In Cirrhinus mrigala fingerlings fed ingredients at 4% of wet body weight twice a day, wheat bran gave lower body weights and a higher feed conversion ratio than maize guten feed and sunflower meal (Shabir et al., 2003). In South American characids, black pacu (Colossoma macropomum, also called tambaqui and gamitana) and red pacu (Piaractus brachypomus), cassava root, plantain fruit and peach-palm fruit (Bactris gasipaes) gave better growth than wheat bran and wheat middlings in diets containing 30% of the test ingredient (Lochmann et al., 2009). In Colossoma macropomum, a diet including 23-25% wheat bran, formulated to contain 25% protein and a DE of 11.3 MJ/kg, gave better growth and feed conversion than diets containing 35% protein, or 25% protein and less DE (Gutierrez et al., 2009). Digestibility of DM and CP in red pacu were found to be lower for wheat bran than for soybean meal, fish and maize grain. The apparent DE of wheat bran was estimated at 7.5 MJ/kg, half that of maize (14.0 MJ/kg), 2/3 that of soybean meal (10.0 MJ/kg) and much lower than that of fish meal (16.0 MJ/kg) (Fernandes et al., 2004). In juvenile cichlids Sarotherodon melanotheron, maize bran was a better feed than chicken droppings and wheat bran. Survival rate with the by-products was consistently lower than with commercial feeds (Ouattara et al., 2005). Mullet fry could be reared on a diet containing fish meal and wheat bran at the ratio of 3:1 and fed at 10% of body weight (Enbayah et al., 1987 cited by Hertrampf et al., 2000). There is little literature on the use of wheat bran in diets for crustaceans. Hertrampf et al., 2000 recommended a maximum inclusion rate of between 2 and 5%, though higher rates may be possible depending on the species. In postlarval blue shrimp (Penaeus stylirostris), a diet containing 30% mussel meal, 15% squid meal, 5% soybean meal, 20% fish meal and 22% wheat bran supplemented with live Artemia nauplii gave the best growth and survival rates (Fenucci et al., 1984). Wheat bran fed alone was unsuitable for brine shrimp Artemia salina (Hertrampf et al., 2000). Allen, J. C. ; Hamilton, R. J., 1994. Rancidity in Foods. 3rd edition. Aspen Publishers, Inc.
Dadalt, J. C., 2015. Nutrient balance and ileal amino acids digestibility of some ingredients fed to weaned pigs with or without multi-carbohydrase and phytase suplementation. PhD Dissertation, Universidade de São Paulo, Faculdade de Medicina Veterinária e Zootecnia, 2015, 118 pp. Ellis, L. C. ; Tillman, A. D., 1961. Utilization of phytin phosphorus in wheat bran by sheep. J. Anim. Sci., 20: 606-607. Hines, R. H., 1980. Utilization of wheat bran in finishing swine diets. In: Report of progress 388, pp. 22-23. Kansas State University. Agricultural Experiment Station and Cooperative Extension Service, Kansas, US. Kent, N. L. ; Evers, A. D., 1994. Technology of cereals: an introduction for students of food science and agriculture. Woodhead Publishing, 334 p.